Leever, Martin G. Richter, Kenneth Nelson, Peg Allman, Christopher J. and Wyeth, Duncan 2012. The Case of Do-Not-Resuscitate (DNR) Orders and the Intellectually Disabled Patient. HEC Forum, Vol. 24, Issue. 2, p. 83. Kelly, P. J. 1994. The Bentham Bibliography: Recent Additions. Utilitas, Vol. 6, Issue. 02, p. 343. 1 Kelly, P. J., Utilitarianism and Distributive Justice: Jeremy Bentham and the Civil Law, Oxford, 1990. I will refer to pages in this volume between parentheses in the text of this review. 2 I follow Kelly's reference to well-being rather than pleasure and pain. If Bentham embraced AU, it would probably refer to probable consequences—a complication we can ignore. 3 Kelly calls the security-providing principle ‘formal’, though none of its functions fit that characterization; and he calls the disappointment-preventing principle ‘substantive’, though it is no more substantive than the other principle (cf., e.g., pp. 8, 74, 94 and 140). Kelly's use of philosophical terminology is generally confusing and unhelpful. 4 They would seem rather weak, defeasible reasons. 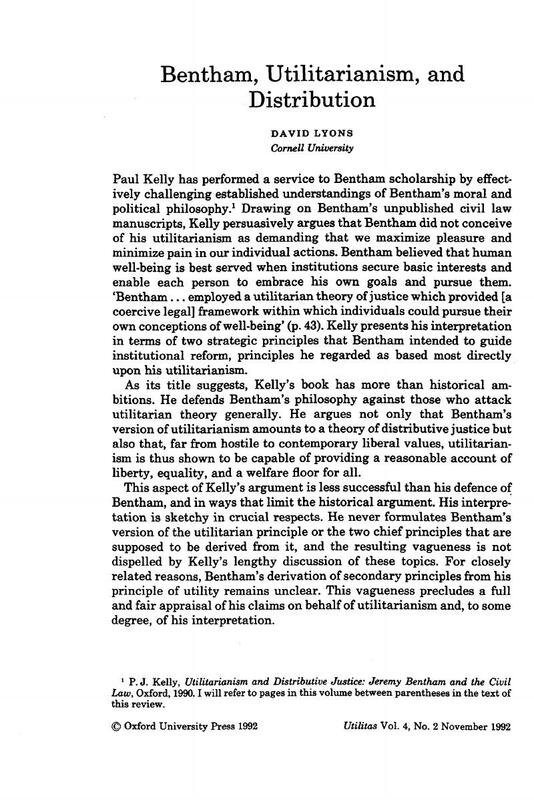 5 Kelly refers specifically to the security-providing principle and the disappointmentpreventing principle as Bentham's two principles of distributive justice (cf., e.g., p. 140).